As I have watched the news lately, I have become even more alarmed at the cost of food. Prices have risen astronomically, and it is scary to think about. It’s not really an optional item in anyone’s budget. We all need to eat. So what are we to do? I, for one, can think of a lot of options, and none of them include not eating at all. Most of us have within us an ability to work. Quite a few of us have a little space, or a lot of space, that we could use for a garden. 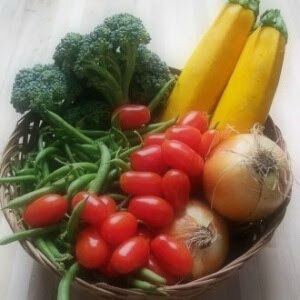 I have heard a lot of people complain that it’s not worth it to grow a garden, and that they can get the food cheaper at the grocery store when they consider their time and all. Perhaps to them it’s the better option, but I, for one, could not afford to purchase all that my family can eat. And besides, we have an affinity for fresh berries, and we would have to take out a loan to buy what we eat every year just in that category. It is true that many foods are readily available at a reasonable cost during the case lot sales. But that may not always be true, and prices will continue to rise. Certainly, there are some things that we need to purchase, but there are a lot of items that we can grow ourselves. The idea is to make the funds available to us go as far as possible. And a little hard work really doesn’t hurt anyone, even children, although they may sometimes have a different opinion. In order to maximize the usable yield from our gardens, it is important to start with a plan. What does your family really like? What won’t they touch? How much of something will they eat before they get tired of it or it goes bad? There isn’t much sense in planting a whole row of radishes if your children would rather play kick ball with them. Perhaps a few would be fun because they come up fast and grow fast, but mix them in with the carrots, and they don’t take any more space because they are ready to pull before the carrots get big. Are carrots a big thing in your family? Can they eat a five-pound bag in a week if there is veggie dip? Then maybe one row wouldn’t be enough. My sister- in-law pulls carrots, leaving the fluffy green top on, and tells her children they are “What’s up, Doc?” carrots, and the kids think they are so cool. We plant lots of carrots so we can eat all we want during the summer. Then we are sure to have enough left over for drying and cold storage through the winter. Corn is very popular at our house. We can eat it at dinner for several weeks and not get tired of it too fast. We also freeze a lot of it. We don’t like the taste of home canned corn, though. So when we plan how much corn to plant, we think of three things. First, how much do we want to freeze? Then how much do we want to eat? Third is how to stagger the ripening of the ears. Either we plant it in two or three plantings about two weeks apart, or we use three different varieties that take a differing numbers of days to mature. For fresh eating we want it to ripen gradually, but when I freeze it, I would rather it all ripen at once so I can get the job over with. We are also very careful to plant corn in blocks instead of single rows so that they are pollinated more thoroughly. We like to grow enough pumpkins to let each person in the family either carve one or draw on one for Halloween, according to age. We also want a few more for pies and breads. However, I don’t really think we need five dozen of them, although I am sure the neighbors would be happy to help us dispose of them if we did end up with that many. That brings up another point. Gardeners are fond of sharing. I think it’s partly because they like to be good neighbors, but I also think that there may be some bragging rights involved. We had a neighbor who grew onions the size of basketballs, and I am not exaggerating. They were huge! He loved sharing them with friends and neighbors. My bragging rights come from handing our tomatoes to neighbors in June from the plants in our greenhouse, while their plants are still only ankle-high. I love to share what I have grown, and I love to be the recipient of someone else’s bounty. I have found great new varieties this way, and have learned some new techniques. Never be afraid to ask someone for advice. Gardeners love sharing information too! Our family likes peas, fresh and frozen. We plant a lot of them too, but not as many green beans, even though we can a bunch every year, and eat some fresh. We don’t do much with kohlrabi or turnips, but we should. Broccoli is great to have, but I don’t seem to be able to grow much of it. Potatoes are a big crop for us. We eat a lot of them, and the children love to go out with Dad to dig them up in the fall. It’s a treasure hunt for them. But we are always careful to plant some red potatoes that will be ready to eat much earlier, when the peas are on, so we can have the old family favorite dinner of peas and potatoes. We plant several rows of potatoes. Consider planting cucumbers, summer squash, cabbage, tomatoes and peppers, among others. I like to plant a lot of tomatoes. We like them in tacos, BLT sandwiches, and I make lots of salsa and spaghetti sauce. I have a few children that will eat them like one would eat an apple. I certainly don’t want to run out of them! I also grow the onions and peppers for the salsa, and I need to grow lots of onions for freezing and drying. That makes it easy to throw a handful of them into a soup. When I set out our garden, I take the needs of our family into consideration and plot out our available space with what is most important to us. There is no reason to waste time and space on something that they won’t eat. But then, maybe a little of something new would be good for them. Just don’t turn half of your garden into a brussels sprouts patch if your family will mutiny if you serve them more than once a year. Think about staggered planting, or two crops in one season, such as lettuce or peas. How much does each foot of row produce? How much do you really need? Remember that the first year that you raise a garden is a learning experience. Also remember that the twentieth year that you raise a garden is a learning experience. You will always find new and better ways to do things, and you will also find out what really doesn’t work for you. You will be able to experiment with different varieties of vegetables, and perhaps some wonderful neighbor will share some heirloom seeds with you. Gardening is definitely an adventure! Our children, as they fill their tummies with fresh bread and fresh homemade raspberry jam and an apple or carrot on the side, or with still-warm peas from a sun-kissed pod, talk about how wonderful their life is. It really makes me smile. What they are eating is quite inexpensive, but very good for them, and they are probably also content remembering that they helped weed, water and pick the produce, and that gives us all a great deal of satisfaction.